The big news on Thurday, December 3rd 2009 was that the Phillies have signed Placido Polanco for a three year contract for $18 million dollars to play third base for them. The thrill didn’t reach Phillies themed blogs though and by the end of the day, most blogs gave a sour impression on the deal. Polanco was a former Phillies player who left the team in after 2004 and has been with the Tigers for the past 5 seasons. The highlight year of his tenure with the Tigers was in ‘07 when he was an All Star and won a Gold Glove and Silver Slugger award. He also won a Gold Glove last year, but this was at second base, not third base as the Phillies plan to utilize Polanco at. The signing of Polanco, given the apparent desire to pennypinch, is confusing because Amaro did not give the market a chance to play out, much like last season with Ibanez. The only reason one should jump out so quickly to sign a player is if he is going to be pursued heavily by many other teams or if the player can be signed cheaply. Polanco doesn’t fall under either criteria; he is simply a mediocre infielder who hasn’t played third base since 2005, and hasn’t played 200 innings at the position since 2002. As for his production, Polanco has regressed offensively since 2007. His wOBA has gone from .371 to .339 to .321. For comparison, in ‘09, Justin Morneau had a .371 wOBA, Erick Aybar was at .339, and Kurt Suzuki finished at .321. As his wOBA has fallen, so has his walk rate, and his strikeout rate has risen. His OBP fell over 50 points from ‘07, which should be an alarming trend considering they did not sign Polanco for his power. Defensively, Polanco is good… at second base. He won Gold Gloves at second base in ‘07 and ‘09, matching up with his UZR/150 of 12.0 and 11.0 respectively. However, the Phillies signed him to play third base, a position he hasn’t played since ‘05. The only season in which there is a large sample of innings and UZR data, 2002, Polanco had a UZR/150 of 7.8, which isn’t bad. A lot changes in eight years, though. It’s unlikely Polanco still has the range, agility, and arm strength he had eight years ago. 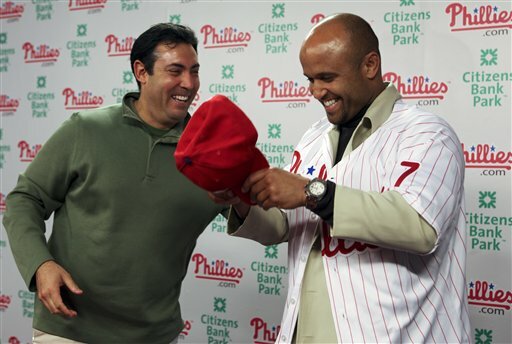 The Phillies have signed Placido Polanco to a three-year, $18 million contract. Polanco will play third for the Phils in 2010. I think this is bad news for Phillies fans, but confused by the fact that Polanco is a very good baseball player. The problem is that he’s a good baseball player because he plays second base. He’s not a third baseman. I don’t think there’s much of an argument there. Polanco has not appeared at third base in any of the past four years. On the plus side, he is a very good second baseman and has played more than 2,400 innings at third over his career, so it seems pretty likely he can give the Phillies good defense at third. I feel a little less sure about that than I would about someone who actually provided some team good defense at third over the past four years, though. My first reaction here is despair--well, actually, it's self-flagellation for suggesting that it might be time to trust the Phillies. On its face, this just doesn't make a lot of sense: the team is about to overpay for the decline stage of a player with very little power or speed, being asked to shift positions no less--all while two clearly better options, Chone Figgins and Adrian Beltre, remain on the market. That said, if both of those players receive deals for three years or longer, and get paid upwards of $10 million a year, the Polanco contract makes some sense. But those are big ifs, and even if true it doesn't make the Phils a better team on the field in 2010. I absolutely hate the Polanco signing. He has great value as a second baseman, but he simply doesn't have the bat to play third. He is one dimensional singles hitter with little speed and above average defense. Polanco registered an OPS of .727 in 2009, which would rank sixth lowest among third baseman. His homerun total (10) ranks third lowest, sadly tied with David Wright. You can make the argument that Polanco will be a better fit to a Phillies lineup that already has its fair share of power hitters. And when you put his numbers side by side with Pedro Feliz, it appears to be a push. But Pedro Feliz is a gold glove caliber third baseman. Polanco is no slouch with the glove, but he is a true second baseman. And you can't look past the fact that Feliz was a member of the 2008 championship team. It's also hard to overlook the fact that better free agent third baseman are on the market. As far as I'm concerned, this is a big mistake. The Phillies do have a fantastic track record when it comes to making moves like this one, but I feel like they are moving in the wrong direction this time. excited to look at much more of your current writing, have a good one!